Co-authored by Deborah Rivel, owner of Wildtones, this book is a detailed insider’s guide to the best places to find birds in New York City and on Long Island in all seasons. 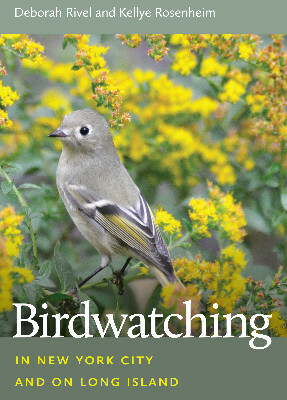 This easy-to-use bird watcher’s guide gives seasonal information for both popular birding sites and those off the beaten path. Precise directions to the best viewing locations within NYC and Long Island’s diverse habitats enable birdwatchers to efficiently explore urban and wild birding hotspots. Over 400 species of birds can be seen in New York City’s five boroughs and on Long Island, one of the most densely populated and urbanized regions in North America, which also happens to be situated directly on the Atlantic Flyway. In this fragmented environment of scarce resources, birds concentrate on what’s available. This means that high numbers of birds are found in small spaces. In fact, Central Park alone attracts over 225 species of birds, which bird watchers from around the world flock to see during spring and fall migration. Beyond Central Park, New York City’s five boroughs and Long Island have numerous wildlife refuges of extraordinary scenic beauty where resident and migratory birds inhabit forests, wetlands, grasslands, and beaches. These special places present an opportunity to see a wide array of songbirds, endangered nesting shorebirds, raptors, and an unprecedented number and variety of waterfowl. Including the latest information on the seasonal status and distribution of more than 400 species, with 39 maps and over 50 photographs, this full-color guide features information essential to planning a birding visit. It will become the go-to book for both the region’s longtime birders and those exploring the area for the first time.